Residents evacuate from their flooded town, north of Bangkok, on October 25, 2011. Around 320 people have died in flood-related incidents since late July according to the Department of Disaster Prevention and Mitigation, as Thailand experiences the worst flooding in 50 years with damages running as high as $6 billion. Flood waters surround an industrial complex in Bangkok, Thailand, on October 20, 2011. Hundreds of factories closed in the central Thai province of Ayutthaya and Nonthaburi with flood waters reaching Bangkok. A television news reporter speaks to a camera in a waterlogged street near the Chao Praya river in Bangkok, on October 26, 2011. Thailand's premier warned nervous Bangkok citizens that incoming floods could last for four weeks, as waters inched nearer the city center. Storm clouds gather over a village in Nonthaburi province, on the outskirts of Bangkok, on October 14, 2011. Workers repair a collapsed canal embankment in the flooded Pathum Thani province, on the outskirts of Bangkok, on October 18, 2011. A woman holds her child as she wades through a flooded street near Mahathat temple in Bangkok, on October 26, 2011. Thai Airways Airbus A300 airplanes sit parked on the flooded tarmac at Don Muang airport in Bangkok, on October 26, 2011. The planes' landing gear has been wrapped in protective plastic. Thai Dhammakaya monks and volunteers work to fortify the flood gate and barrage, made of sandbags and pipes, at Klong Rapi Pat, on October 23, 2011 in Klong Luang on the outskirts of Bangkok. The flood gate, approximately 8km long at Klong Rapi Pat, is one of the most critical of the last fortifications before the flood waters flow into the inner city of Bangkok. A Thai girl clutches her belongings as she waits for some help to cross floodwater as people leave flooded areas in Bangkok, on October 26, 2011. A worker watches as water is pumped out of a canal in Pathum Thani province, a suburb of Bangkok, on October 19, 2011. An aerial view of treetops and their reflections in a flooded area in Pathum Thani province, on the outskirts of Bangkok, on October 14, 2011. People paddle toward food dropped by a Thai army helicopter to their village isolated by floods in Ayutthaya province near Bangkok, on October 25, 2011. A woman rests on a mattress after she was evacuated from an area affected by the floods at the collective shelter at Sports Science Center in Bangkok, on October 26, 2011. A flooded residential area in the suburbs of Bangkok, on October 25, 2011. A rat searches for an escape route from of a piece of floating debris in Pathum Thani on the outskirts of Bangkok, on October 22, 2011. Hundreds of factories closed in the central Thai province of Ayutthaya and Nonthaburi as the waters come closer to Bangkok. Statues of Ronald McDonald and the Hamburglar, outside a flooded McDonald's restaurant in Bangkok, on October 24, 2011. Millions of people in the Thai capital nervously prepared for the advancing and seemingly unstoppable flood waters after a fresh warning for residents to evacuate certain danger zones. People row their belongings through floodwaters during an evacuation from a garbage-strewn flooded market in Bangkok, on October 24, 2011. Buddha statues, covered in plastic to protect them from the floodwaters in Bangkok, on October 24, 2011. A resident drags his belongings through the floodwaters as he evacuates Bangkok on October 24, 2011. Englada, the daughter of Thawatcha Busabim, is carried by a relative during Thawatcha's funeral procession at the Wat Preak Prachkor temple in Pathum Thani province, a suburb of Bangkok, on October 19, 2011. Thawatcha, 30, was electrocuted when he tried to use an electric appliance at his flooded home in Pathum Thani. Thai Dhammakaya monks push a truck, stuck in mud, as they work to fortify the flood gate at Khlong Rapi Pat on October 25, 2011 in Khlong Luang on the outskirts of Bangkok, Thailand. A cat drinks from a walkway in a flooded neighborhood in central Bangkok, on October 23, 2011. Floodwaters stretch to the horizon on October 20, 2011 on the outskirts of Bangkok, Thailand. A man paddles his boat through flooded suburbs of Bangkok, on October 25, 2011. A family floats back to their house on a handmade raft in Klong Luang on the outskirts of Bangkok, Thailand, on October 23, 2011. A man pushes a car through deep water on a flooded street in Bangbuathong, Thailand, on on October 24, 2011. Buddhist monks splash each other as floods continue to hit Pathum Thani province on October 14, 2011, north of Bangkok, Thailand. Partially-submerged homes in the hard-hit province of Pathum Thani, north of Bangkok, on October 16, 2011. A woman holds her dog, waiting for transport along the newly flooded streets near the Chao Phraya river in Bangkok, on October 25, 2011. A Buddhist monk walks in floodwaters at a temple in Bangkok's historic center on October 26, 2011. A man walks with fish which he caught along the swollen Prapa Canal in Bangkok, Thailand, on October 22, 2011. Seen in a mirror, a Thai mahout rides his elephant on a flooded street in Ayutthaya province, on October 14, 2011. Children play in water as floods advance in their neighborhood at Sai Mai district in Bangkok, on October 22, 2011. Cars are parked on a highway overpass to avoid floods in Ayutthaya province near Bangkok, on October 25, 2011. A dog barks as another looks on while stranded at a fire station surrounded by flood waters in Pathum Thani on the outskirts of Bangkok, on October 22, 2011. A man sleeps on the bench at a flooded pier at the Chao Praya river in central Bangkok, on October 16, 2011. Relief workers reinforced barriers on Sunday to help defend Thailand's capital, Bangkok, from the country's worst floods in half a century and efforts were stepped up to protect a huge industrial estate to the city's north. A boy holds aloft banknotes to keep them dry while he swims during the flood in Nonthaburi province, suburban Bangkok, on October 15, 2011. Businesswomen make their way through the floodwater as it advances into central Bangkok, on October 26, 2011. Residents sit on a bridge and hold homemade spearguns while looking for fish in the rising water on the outskirts of Bangkok, on October 26, 2011. Flood victims make their way through the high waters along the flooded streets in Rangsit on the outskirts of Bangkok, on October 24, 2011. A woman hangs onto a street sign in chest deep water along the flooded streets in Rangsit on the outskirts of Bangkok, on October 24, 2011. Local residents stand on a makeshift shelter next to a temple as the night falls on the floodwaters near the Chao Praya river in Bangkok, on on October 31, 2011. Residents stand as water from the swollen Chao Phraya River flows through a shopping center, located on its bank, in Bangkok, on October 29, 2011. Water from the swollen Chao Phraya River flows through a house, located on the riverbank, as a policeman watches a Thai woman cooking in Bangkok, on October 29, 2011. An aircraft is parked in floodwaters at Don Mueang airport in Bangkok, on October 30, 2011. A man works at a desk in his flooded warehouse in Chinatown in central Bangkok, on October 31, 2011. A Thai man pumps water out of his flooded home, holding the hose between his legs in a neighborhood along Chao Phraya River, on October 27, 2011 in Bangkok. A dog peers over a fence in a flooded area of Bangkok, on October 27, 2011. A Thai woman washes in floodwaters at her home along the Chao Praya river in Bangkok, on October 31, 2011. Local residents evacuate their flooded neighborhood on the back of a truck in an area near the Chao Praya River in Bangkok, on October 29, 2011. Thai and foreign volunteers prepare relief items for flood victims at the national stadium in Bangkok, on October 29, 2011. A Thai flood victim prays while a monk chants at a crowded evacuation center in Bangkok, on October 30, 2011. Thousands of flood victims have been forced to take shelter at crowded evacuation centers around the capitol city. Hundreds of factories have been closed in the central Thai province of Ayutthaya and Nonthaburi. A flood victim uses a boat to inspect his partially submerged house in Thon Buri, outside Bangkok, on October 28, 2011. A man takes a nap at a flooded bus stop in Bangkok, on October 31, 2011. Local residents walk on a divider in a flooded street near the Chao Praya River in Bangkok, on October 30, 2011. A Buddhist monk walks in a flooded street to collect morning alms in Bangkok, on October 29, 2011. A woman moves her pots as floods advance into a market outside the Grand Palace in Bangkok, on October 28, 2011. A woman scoops water from her home in a flooded neighborhood close to the rising waters of the Chao Phraya River on October 30, 2011 in Bangkok. A man sits at a flooded warehouse as water pours in, in Chinatown, central Bangkok October 31, 2011. A woman needing medical attention is lifted by Thai rescuers as she is evacuated to a hospital, in the floodwaters near the Chao Praya River in Bangkok, on October 31, 2011. A woman leaves a flooded market in Chinatown in central Bangkok, on October 31, 2011. A Thai man takes pictures with his son on a custom-built tricycle designed to go through floodwaters in Bangkok, Thailand, on October 28, 2011. Thai soldiers hold onto each other, pulling against the stream of water flowing into a neighborhood after a wall was breached by the swollen Chao Phraya River in Bangkok, Thailand, on October 30, 2011. A man watches the news on TV in his flooded house, near the Chao Phraya river in Bangkok, on October 31, 2011. Tensions were rising between Thai residents and authorities in flooded parts of Bangkok, with hundreds protesting that their homes were being sacrificed in attempts to keep the city center dry. Rescue boats and other small craft run along a swollen canal as sunset on the outskirts of Bangkok, on October 27, 2011. Residents poured out of the Thai capital by bus, plane and train Thursday, heeding government warnings to use a special five-day holiday to evacuate parts of the flood-threatened metropolis. A 42-year-old motorcycle taxi driver Chatchawal Phuengwut poses with a python he caught in floodwaters just outside the Grand Palace in Bangkok, on October 28, 2011. A man wades past sculptured hedges submerged by flood waters in a median in Bangkok's Bang Phlat district on October 30, 2011. Peak tides tested Bangkok's flood defenses on Sunday as hope rose that the center of the Thai capital might escape the worst floods in decades, but that was little comfort for swamped suburbs and provinces where worry about disease is growing. A man walks along sandbags as floodwaters rush through a market near the overflowing Chao Phraya river, on October 29, 2011 in Bangkok. Buddhist statues stand partially-submerged as floodwaters inundate a covered market along the Chao Phraya river in central Bangkok, on October 30, 2011. Volunteers lower bottles of drinking water with a rope to rescue workers at a flooded area near the Chao Praya River in Bangkok, on October 30, 2011. A girl washes her hair in a flooded street in central Bangkok, on October 26, 2011. An aerial view shows flooded residential areas in the north parts of Bangkok, in this photo taken by Kyodo on October 30, 2011. A Thai couple push a cart passing by empty shelves inside a supermarket due to the food suppliers distributor center being affected by flooding in Bangkok, on October 29, 2011. People visit a shopping mall in Bangkok, on Sunday, October 30, 2011. On one side of Bangkok, you'll find the victims of Thailand's worst flooding in half a century. But just a few miles away, you'll find something else entirely: well-heeled shoppers perusing bustling malls decorated with newly-hung Halloween decorations, couples sipping espresso in the air-conditioned comfort of ultra-chic cafes. Flood victims walk on an empty highway as they evacuate Bangkok October 27, 2011. Thailand's worst flooding in half a century, caused by unusually heavy monsoon rain, has killed at least 373 people since mid-July and disrupted the lives of nearly 2.5 million, with more than 113,000 in shelters and 720,000 people seeking medical attention. Thai residents make their way across a flooded street near the rising waters of the Chao Phraya River, on October 29, 2011 in Bangkok. A Thai woman struggles to walk as floodwater gushes through a marketplace in a riverside neighborhood near the Grand Palace in Bangkok, on October 27, 2011. A man takes pictures of a flooded area in central Bangkok, on October 31, 2011. A boy plays in the water outside a flooded temple in Chinatown in central Bangkok, on October 31, 2011. Thai soldiers and municipality workers work to fortify a broken flood barrier in Bangkok, on October 31, 2011. The Intergovernmental Panel on Climate Change says that extreme weather disasters like the recent record floods in Thailand are striking more often, according to a draft summary of a report obtained by The Associated Press. It says there is at least a 2-in-3 probability that climate extremes have already worsened because of man-made greenhouse gases. Read the full story. Residents walk along a major flooded intersection in the Thonburi area of Bangkok, Thailand, on October 31. Thousands of flood victims have been forced to take shelter at crowded evacuation centers around the capital. Thailand is experiencing the worst flooding in over 50 years which has affected more than nine million people. Residents wade through floodwaters at Bang Phlat district in Bangkok on Nov. 1. Higher than normal tides pushing into the Chao Phraya river from the Gulf of Thailand in recent days have complicated efforts to drain floodwaters flowing from the country's central heartland, where vast areas have been submerged for up to two months. Buddhist monks paddle through a flooded temple where hundreds of victims found shelter, in Bangkok on November 1. Anger mounted among victims of Thailand's catastrophic floods on Tuesday as water flooded new neighborhoods as it made its way to sea. Commuters travel on a bus through floodwaters in Bangkok on November 1. According to local media reports, it will take at least ten days to drain 5.5 billion cubic meters of floodwaters north of Bangkok around the capital and then into the sea. 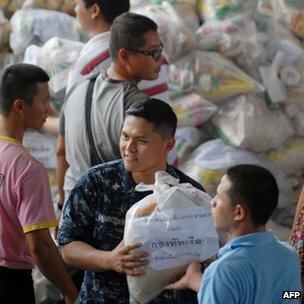 World Blog - Is the tide turning in Thailand's floods? BANGKOK — Shielded by hundreds of thousands of sandbags piled shoulder high along the city’s outskirts, most of Bangkok remained dry on Sunday, allaying fears for now that the massive metropolis would be swamped by monsoon floodwaters. But along the floodwalls, which ring the city and are patrolled by soldiers and police officers around the clock, there was a mixture of relief and resentment. “I am just hoping this floodwall will break,” said Seksan Sonsak, a 43-year-old factory worker. Mr. Seksan, like several million other Thais, has found himself on the wrong side of the wall. The sandbags hastily erected to protect Bangkok have trapped a giant pocket of floodwater that extends for dozens of miles. By sparing the low-lying capital, which lies in the delta of the country’s main river system, officials sacrificed the provinces to the north. The flooding, the worst in at least half a century, has affected 2 million people and left close to 400 dead, many by drowning or electrocution. 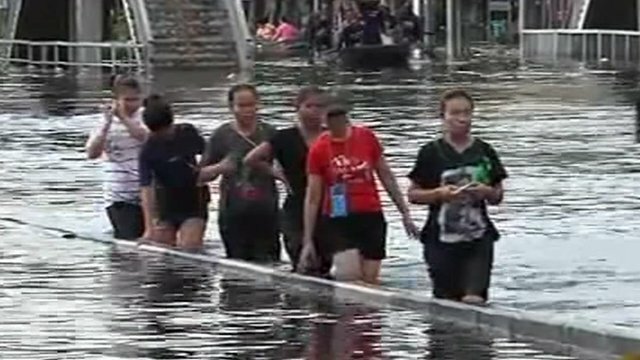 On Sunday, Ms. Yingluck said she was confident that the situation was improving because the floodwalls were mostly holding up. Experts and government officials say favorable weather and the passing of peak tides over the weekend as the water moves out to sea may mean the worst is over for Bangkok. Train service between Bangkok and the northern city of Chiang Mai resumed over the weekend after a month of interruption because of the floods. The main highway linking Bangkok to the north is now also passable. But large swaths of provinces north of Bangkok are likely to remain inundated for several weeks, the government says. And bitterness is likely to persist long after the water has receded and the mud has dried. Some flood barriers have been destroyed under mysterious circumstances in recent days despite the deployment of what the military says is 50,000 troops to guard and maintain them. A nighttime breach last week near the domestic airport, Don Mueang, sent floodwater pouring onto the tarmac of the airport and inundating thousands of nearby homes and businesses. (The main international airport, Suvarnabhumi, is still operating normally.) The surge also forced the government on Saturday to move its crisis-management unit, Flood Relief Operations Center, which had been based at the airport. Still, only 7 of Bangkok’s 50 districts were heavily flooded as of Sunday, mostly along the northern and western rim of the city. Drinking water and other essentials such as eggs and rice remain in short supply, partly because panicked residents are hoarding. Many parts of the city were quiet over the weekend after residents took the government’s advice and evacuated to areas not threatened by flooding. Thailand suffered acute monsoon flooding in 1983 and 1995 but this year’s floods have caused far greater damage, and with global repercussions. The country is a major supplier of electronics and the closing of factories producing computer hard disks has created a global shortage and sharp price increases. The shuttering of factories producing car parts has also disrupted the supply chains of companies such as Toyota and Honda. The flooding appears to have been caused by intense rainfall in September, possibly exacerbated by miscalculations by managers at hydroelectric dams, who reportedly started filling their reservoirs too early in the monsoon season. The rapid expansion of Bangkok in recent years has also hampered drainage of the annual floodwaters. The swamps and canals that once absorbed the monsoon run-off and allowed it to flow to the sea have been paved over or converted into industrial parks and housing complexes. Those who live close to the floodwall say they realize that the sandbags are the only thing keeping them from total inundation. Kusuma Thongin, a 56-year-old grocery store owner, says she looks toward the wall and the fetid water behind it each morning and issues an invocation. “I pray to the water: please, don’t come,” she said. The Thai authorities have asked US military helicopters to survey flooding, which has hit the north and is now threatening the capital Bangkok. Two Seahawk helicopters aboard the USS Mustin warship would conduct "aerial reconnaissance", the Pentagon said. The warship is docked at the port of Laem Chabang, just south of Bangkok. Thai officials say high tides due on Saturday and the flow of run-off water from inundated central plains could cause wider flooding in the capital. City residents are continuing mass exodus, after the authorities urged them to leave Bangkok. Heavy monsoon rains have been causing flooding in Thailand since July. More than 370 people have been killed and swathes of the country affected. John Kirby, the captain of the USS Mustin, said Thailand had asked the warship to prolong its stay at the port for up to six days. "The Thai government has asked to have it stick around to help out," he told reporters on Friday. The destroyer docked at Laem Chabang a few days ago for what expected to be a week-long sting. The Thai government had initially said it did not require assistance from the US navy with flood relief efforts. Meanwhile, water levels in Bangkok's Chao Phraya River river hit a new high - 2.47 metres above sea level - as residents continued to leave the capital ahead of possible flooding. Authorities fear that the river, which bisects Bangkok, could burst its banks when water levels rise because of unusually high seasonal tides over the weekend. 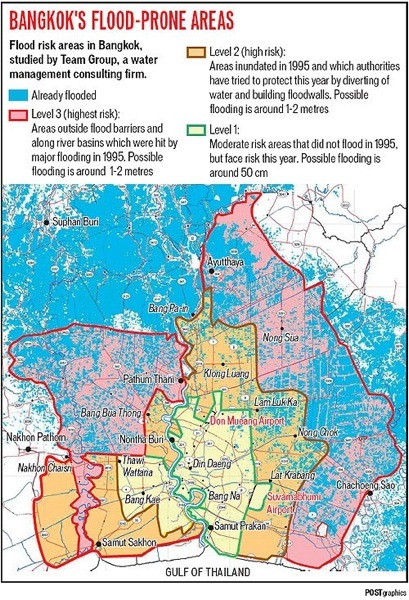 Flood waters are continuing to creep into northern districts of Bangkok but the centre remains mostly dry. Roads in and around the capital remained jammed as residents used a five-day holiday to leave the city. Prime Minister Yingluck Shinawatra said she was assessing a proposal to dig channels into some roads in eastern Bangkok to help water drain through to the sea. On Friday, the Bank of Thailand slashed its growth forecast for the current financial year to 2.6%, down from an initial projection of 4.1% growth. The flooding is also disrupting global supplies of computer hard disk drives and car parts. A number of factories in Thailand - one of the world's leading manufacturing bases - have shut down production, and it is now yet known when they will become operational again. Among the affected companies are Toyota Motor, Honda Motor and Lenovo Group Ltd - one of the biggest computer makers. Apple chief executive Tim Cook has warned that he is "virtually certain" that the flooding will lead to an overall industry shortage of hard disk drives. "Like many others, we source many components from Thailand," he was quoted as saying by the AFP news agency. Are you in Thailand? Are you affected by the floods? Please send us your comments using the form below. Much of central Bangkok is still okay, but there are ongoing worries about parts of the city outside the center, especially to the west, north, and east. (See new map below.) Much will depend on rains and tides in the coming days. The international airport, Suvarnabhumi, so far appears to be fine. Ayutthaya and central Thailand have been hit hard. Hundreds have died and many more displaced throughout Thailand. But for those wondering about tourism in Thailand, again: most of central Bangkok has not been affected. The areas near the Chao Phraya river, however, and particularly the western and northern portions of Bangkok, are at risk. And again, Ayutthaya and central Thailand have faced serious flooding. Thailand said floods that have killed more than 283 people and hurt exports may last until the month’s end, swamp Bangkok and cut deeper into economic growth. As some of Thailand’s worst flooding in half a century bears down on Bangkok, submerging cities, industrial parks and ancient temples as it comes, experts in water management say it is human activity that is causing nature to run amok. Deforestation, overbuilding in catchment areas, the damming and diversion of natural waterways, urban sprawl, and the filling-in of canals are combining with bad planning to turn an unusually heavy monsoon season into a disaster, they say. Workers hurriedly dredged canals and cut new waterways around Thailand’s capital on Thursday in an attempt to protect the city from the country’s worst floods in decades. Bangkok has been mostly spared so far, but areas on its outskirts have been inundated and authorities fear that flood waters rushing from the north will combine with rains in the next few days to flood the city. For photos of the floods, see this Atlantic In Focus post from yesterday. Children play in a flooded street in Sena district, Ayutthaya province, about 80 km (50 miles) north of Bangkok, on September 12, 2011. Monsoon rains, storms, floods and mudslides have killed at least 280 people since July, authorities said. Rain clouds approach the city center of Thailand's capital Bangkok, on September 23, 2011. Thai motorists travel through a flooded street during a heavy monsoon downpour in Bangkok, on September 3, 2011. Dozens of people have died in northern Thailand over the past few weeks in floods that have also affected over a million people. This aerial picture shows an under-construction temple surrounded by floodwater outside the ancient Thai capital of Ayutthaya, north of Bangkok, on October 11, 2011. A "reclining Buddha" inundated with floodwaters on October 10, 2011 at an ancient temple -- one of a number of UNESCO World Heritage sites in Ayutthaya province. A Buddhist monk walks through floodwater on a street at a temple in Ayutthaya province, on October 7, 2011. Buddhist monks are evacuated on a pickup truck on a flooded street in Ayutthaya province, central Thailand on October 9, 2011. Rattanaporn, 13, floats along the swollen Yom river near her home on August 23, 2011 in Phinchit, Thailand. Cars sit submerged in floodwater at a Honda car factory outside the ancient Thai capital of Ayutthaya, north of Bangkok, on October 11, 2011. Flooded houses outside Ayutthaya, north of Bangkok, on October 11, 2011. A vendor sells her wares in her flooded shop in Ayutthaya province, on September 30, 2011. A man rests in a shelter after he was evacuated from the flooded area of Ayutthaya province, on October 9, 2011. A railroad track hangs in mid-air after a flash flood caused by heavy rain swept away the ground in Chiang Mai province, northern Thailand, on August 26, 2011. Thai emergency workers carry the body of a child from a collapsed building on September 12, 2011 in Saraburi, Thailand. Flooded Chaiwattanaram Temple, a UNESCO World Heritage site, in the ancient Thai capital of Ayutthaya, north of Bangkok on October 11, 2011. An elephant helps people moving their belongings through a flooded area in Ayutthaya province, on October 8, 2011. A disabled man waits for assistance to cross a flooded street in the town of Sena, Thailand, on September 13, 2011. Prisoners sit near the flooded Ayutthaya prison as they wait to be evacuated to another jail north of Bangkok, on October 6, 2011. A soldier looks through the window of a helicopter over a flooded area in Ayutthaya province, on October 10, 2011. An aerial view of a flooded area in Ayutthaya province, on October 10, 2011. A resident in a boat tries to catch relief goods distributed from a helicopter in Ayutthaya province, on October 12, 2011. Residents catch relief goods distributed from a helicopter in Ayutthaya province, on October 12, 2011. An aerial view of a flooded area in Ayutthaya province, on October 12, 2011. Men herd cows through floodwater outside Ayutthaya, north of Bangkok, on October 11, 2011. Villagers ride on a pickup truck past a broken flood barrier in Pathumthani province, central Thailand Tuesday, on October 11, 2011. A Thai soldier carries a Buddhist monk evacuated from a hospital as floods continue to inundate Ayutthaya province, north of the capital Bangkok, on October 10, 2011. A dog stands on a car inundated with floodwater in Ayutthaya, Thailand, on October 12, 2011. Part of a flooded ancient temple in Ayutthaya province, on October 10, 2011. Children swim near houses affected by flooding in Phnom Penh, Cambodia, on September 26, 2011. The death toll from flooding in Thailand since mid-July has risen to more than 280, while some 200 people have died in neighboring Cambodia, authorities in the two countries said. A man rides a motorbike through flooded streets in Ayutthaya province, on October 7, 2011. A man signals for help from a roof of a submerged house in the flooded area of Ayutthaya province, on October 9, 2011. Family members watch TV lifted onto a cabinet to avoid floodwater at their home in Bangkok, Thailand, on October 3, 2011. A traffic policeman gestures to a car as he directs traffic along a flooded street in Nonthaburi province on the outskirts of Bangkok, on October 12, 2011. Thailand's Prime Minister Yingluck Shinawatra (front right) greets people as she visits a flooded area in Nonthaburi province on the outskirts of Bangkok September 18, 2011. A Thai man smokes a cigarette as he sits in the flooded streets on October 10, 2011 in Ayutthaya, Thailand. A Thai Buddhist monk sits with local residents as they cross floodwaters by boat in Ayutthaya, Thailand, on October 12, 2011. An aerial view of a flooded area along a river in Nonthaburi province, Thailand, on October 12, 2011.